When Lynn native Greg Domey opened the doors of Sin City Cycles back in the city where it all began, it was a welcome homecoming. 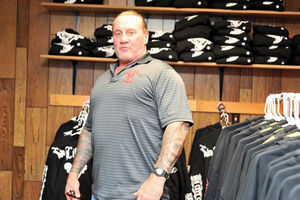 Domey, who first launched the business on Franklin Street in Lynn in 1987, has opened a new apparel shop at 14 Mt. Vernon St. in Lynn. He has a second shop at 352 Central St. in Saugus, which opened five years ago. Both stores stock clothing and accessories for men, women and children. Greg Domey is happy to be back in Lynn. and Domey sold parts and apparel out of a separate store, first on Franklin Street and later on Boston Street. “At the time, Lynn had the highest number of registered Harley Davidson bikes,” said Domey, who comes from a family of motorcycle enthusiasts. His uncle was a biker in Lynn in the 1920s. In the 1970s, Domey was the only student in high school riding a Harley Davidson to school. Although the name of Domey’s company was inspired by Lynn’s “city of sin” label, his intention in coming back is to help make Lynn a city that gives to those in need. Last year, he raised $70,000 for different causes — mostly in Saugus — and he wants to bring that charitable work to Lynn. “What he is doing for the people of Lynn and Saugus is admirable,” said Mayor Judith Flanagan Kennedy. Earlier this summer, Domey visited My Brother’s Table and donated more than 150 T-shirts. Also this year, he has raised $11,000 for two monuments in Saugus, honoring veterans of the Vietnam War and the Global War on Terrorism. In March, he helped raise $10,000 for the treatment of a stage 4 breast cancer patient. Last year, he raised $11,500 for wounded veterans. Another $34,000 was raised at a Halloween ball for breast cancer awareness, with all funds going directly towards the medical bills of six local women battling breast cancer. He also provided holiday presents for more than 200 children in Saugus and Lynn. In addition to the two Sin City Cycles stores, Domey also has a successful online business and ships to patrons in a number of different countries, including Japan and Canada. The apparel is popular in Las Vegas as well. Tanks and T-shirts range from $15 to $20 and sweatshirts are $45. The Lynn store will be open in Lynn from 12 p.m. to 6 p.m. on Mondays and 10:30 a.m. to 6 p.m. Tuesday through Saturday. Funding for the store’s black and red street signage came from the Department of Community Development’s Commercial Facade Program.